The international paper size standard, ISO216, is used throughout the world. The article below gives an explanation as to how these sizes are calculated and a size chart for looking up various A series paper measurements. The ISO paper size A standard is based on each size being half of the size of the previous one, when folded parallel to the shorter lengths. This system allows for a variety of useful applications, such as the enlarging and reducing of images without any cut off or margins, or folding to make a booklet of the next size down. The mathematics behind this useful feature is that the sheets have an aspect ratio (that's the ratio of the length to the width) of the square root of 2. Note: The last item is there because the root 2 aspect ratio doesn't always give a whole number. The dimensions of the A series paper sizes, as defined by ISO 216, are given in the table below in both millimetres and inches (cm measurements can be obtained by dividing mm value by 10). 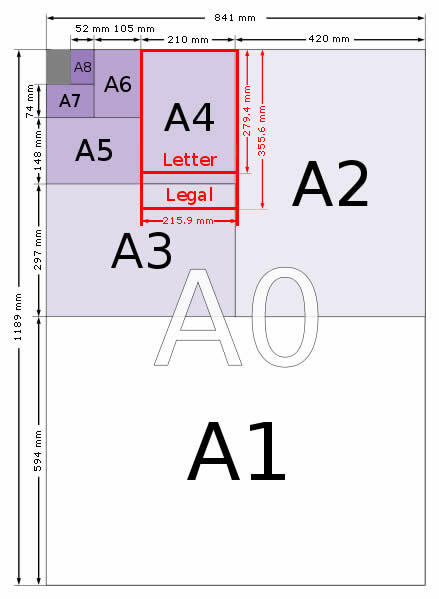 The A Series paper size chart gives a visual explanation of how the sizes relate to each other - for example A5 is half of A4 size paper and A2 is half of A1 size paper. A1 Paper size as defined by the international ISO 216 standard is 841 x 594 mm or 33.1 x 23.4 in. A2 Paper size as defined by the international ISO 216 standard is 594 x 420 mm or 23.4 x 16.5 in. A3 Paper size as defined by the international ISO 216 standard is 420 x 297 mm or 16.5 x 11.7 in. A4 Paper size as defined by the international ISO 216 standard is 297 x 210 mm or 11.7 x 8.3 in. A5 Paper size as defined by the international ISO 216 standard is 210 x 148 mm or 8.3 x 5.8 in. A6 Paper size as defined by the international ISO 216 standard is 148 x 105 mm or 5.8 x 4.1 in. A7 Paper size as defined by the international ISO 216 standard is 105 x 74 mm or 4.1 x. 2.9 in.